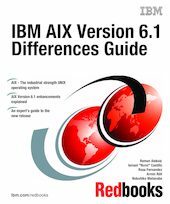 This IBM Redbooks publication focuses on the differences introduced in IBM AIX Version 6.1 when compared to AIX 5L Version 5.3. It is intended to help system administrators, developers, and users understand these enhancements and evaluate potential benefits in their own environments. AIX Version 6.1 introduces many new features, including workload partitions, advanced security, continuous availability, and managing and monitoring enhancements. There are many other new features available with AIX Version 6.1, and you can explore them all in this publication. For clients who are not familiar with the enhancements of AIX through Version 5.3, a companion publication, AIX 5L Differences Guide Version 5.3 Edition, SG24-7463 is available, along with an addendum, AIX 5L Differences Guide Version 5.3 Addendum, SG24-7414, which includes between release enhancements that are available through applying service updates.